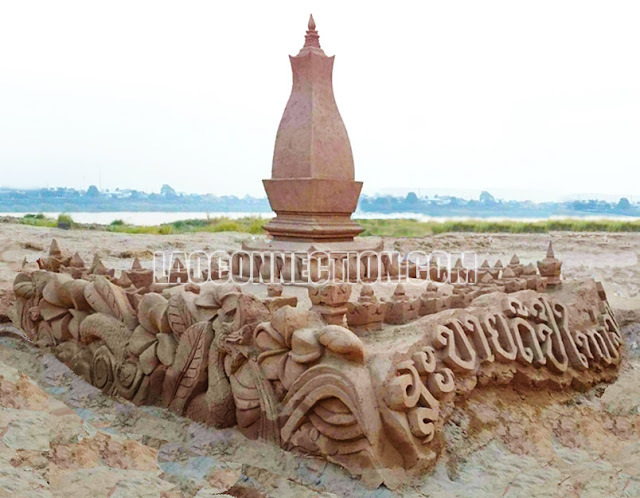 One of the activities done during Lao New Years is the building of sand stupas called dtop ba ty in Lao (ຕົບພະທາຍ). Participants will then plant colorful Buddhist flags and candles and say prayers and make a wish. Some people will also pour additional sand on to the stupa. In recent years in Vientiane people have gone further. The sand stupas have become much more elaborate, as seen here. In Vientiane along the Mekong River during this time of the year the water is naturally low and has receded leaving a sandy base for those to come down on to. It has become the site of many of the sand stupas.